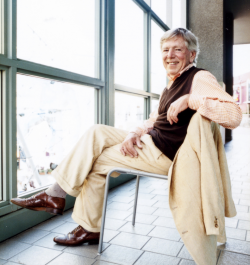 Jon Jerde, an architect who had a profound impact on the cityscape of Los Angeles and beyond, through his reinvention of the shopping center as an “experiential” and entertainment destination, has died after a long illness. He had an itinerant, often isolated childhood. Following his parents’ divorce he lived with his mother in a garage apartment in Long Beach, building cities out of scrap and visiting the Long Beach Pier where he found joy in crowds. Above: Frances Anderton talks to KCRW’s Steve Chiotakis about Jon Jerde and his impact. Jerde enrolled in engineering at UCLA where, says Ambry Jerde, “he paid the low tuition by hashing food at a fraternity” but a chance meeting in 1958 with Arthur Gallion, dean of the School of Architecture at the University of Southern California, lead to architecture school at USC where he established a lifelong friendship with landscape architect Emmet Wemple. After USC he went on a traveling fellowship to Europe, and was dazzled by the communal spaces of old cities for shopping, dining, entertainment, promenading and people watching, fomenting in him his “placemaking” philosophy – creating memorable places that pulsed with life and community, using entertainment and shopping as catalysts. In his early years as an architect he spent many years designing shopping centers which he came to loathe for their soullessness and banality. He was drawn back to retail design by a pivotal project in the early 1980s. San Diego developer Ernest Hahn came to him with the suggestion that he put his ideas into practice in a rundown area of downtown San Diego. 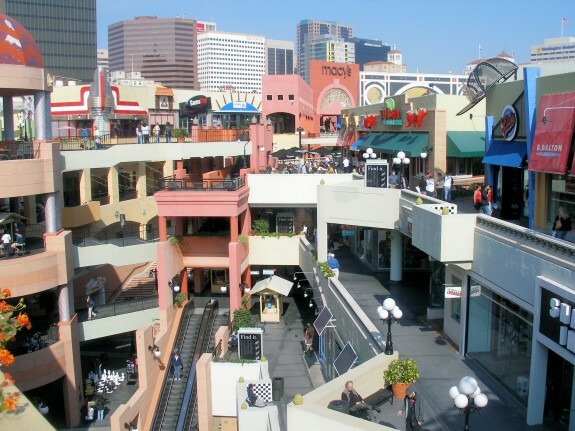 The resulting design, Horton Plaza (below), was open air with winding paths, staggered levels, parapets, colonnades, towers and bridges and riotous use of color. This dramatic rethink of the shopping center model drew 25 million visitors when it opened in 1985, and served as a catalyst for redevelopment of the neighborhood. While Horton Plaza was under construction, Jerde was named “design czar” for the 1984 Los Angeles Olympics. He devised a kit of parts of striking architectural elements with a color palette by environmental designer Deborah Sussman, also color consultant on Horton Plaza, that could be adapted at very low cost to brand hundreds of events around the city. This ephemeral backdrop proved to be one of the more fun, memorable — and affordable — showcases for an Olympic Games. These two projects were pivotal for his firm and his approach to retail design. With his Venice-based firm The Jerde Partnership, he went on to build hundreds of commercial, “experiential” destinations, among them Universal Studios’ CityWalk, themed hotels and casinos in Las Vegas for Steve Wynn, Mall of America in Minnesota and, in the last fifteen years, many large-scale complexes in Asia, including Canal City Hakata, with high canyon-like walls curving around a stream. What mattered in architecture for Jon Jerde was the gathering space between the buildings, more than the individual buildings themselves; and he created many a destination featuring curving “streets” to be lined with cafes and filled with street performers. 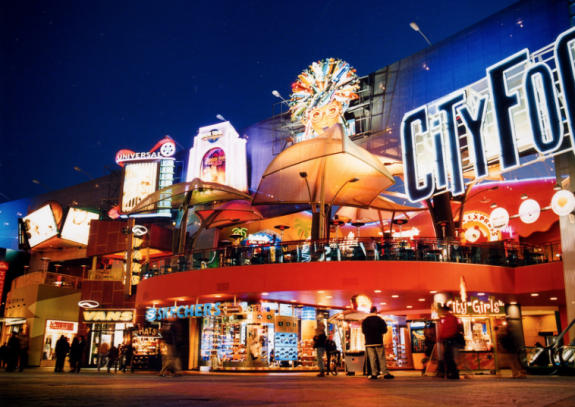 When CityWalk, a signature example of this approach, featuring a distillation of L.A. landmarks, was unveiled at Universal Studios, it elicited criticism for its stagey open-air street concept, stripped of the urban grit and risk of a regular thoroughfare. Ironically, its success might be a partial contributor to today’s preference for open-air downtown shopping areas over the private retail mall model that Jerde had helped revolutionize. DnA’s Frances Anderton got to know Jon Jerde in the 1990s, at time when his brand of themed retail destinations was booming. As editor of a monograph about his work, entitled You Are Here, she enjoyed long conversations with a passionate, opinionated and at times highly amusing Jon about his theories about history, public space in old Europe, narrative architecture as well as the joys of his children and family. This was also a time when some architects, critics and planners expressed disdain for his work, seeing it as a perpetuator of a faux, and highly controlled, urbanism, based on shopping in privately owned destinations that were fundamentally anti-urban. But his many admirers included the futurist Ray Bradbury, and architect Craig Hodgetts, quoted above; both were among his design collaborators (Jerde liked to work in cross-disciplinary teams, a process he called “co-creativity”) and they contributed to You Are Here, which also featured essays by Margaret Crawford and Norman Klein. In many respects Jon Jerde upended assumptions about what architecture could be, he embraced commerce as a medium for civic experience, creating the built equivalent of blockbuster movies that don’t win Oscars but won him millions of fans. Jerde was named a Fellow by the American Institute of Architects in 1990 and was honored as the first USC School of Architecture Distinguished Alumnus in 1985. He was very involved with the USC School of Architecture throughout his career and frequently taught courses in Los Angeles and at the school’s campus in Saintes, France. In 2000 the Jon Adams Jerde, FAIA, Chair in Architecture was established and his family funded the USC Traveling Fellowship in perpetuity in honor of Jerde being its first recipient. Jerde is survived by his wife Architect Janice Ambry Jerde, who led a transition to shift ownership of The Jerde Partnership to its current partners in 2013. Married in 1990 they have a son, Oliver, a junior at Tulane University. Jerde and his first wife, Gail X. Factor, recently deceased, had two children, Jennifer Jerde-Castor and Christopher Jerde. He and his third wife, Cheryl Shaw Barnes, had two children Maggie Jerde-Joyce and Kate Jerde-Cole. He had no children with second wife Elizabeth McMillian. Grandchildren are Nell and Gwen Castor and Tristan James and Emmett Joyce. A memorial service is planned at a future date. To honor his memory, contributions can be made: to the UCLA Foundation to support the work of Dr. David Reuben of the UCLA Alzheimer’s & Dementia Care Program, mark as tribute to Jon A. Jerde in the memo line, and send to UCLA Health Sciences Development, Attn: Jenn Brown, 10945 Le Conte Avenue, Ste 3132, Los Angeles, CA 90095; or to Ancient Egypt Research Associates, Inc.. 26 Lincoln Street. Boston, MA 02135; or to Jon Adams Jerde, FAIA, Endowment at USC School of Architecture, University Park Campus, Los Angeles, CA 90089-0291.